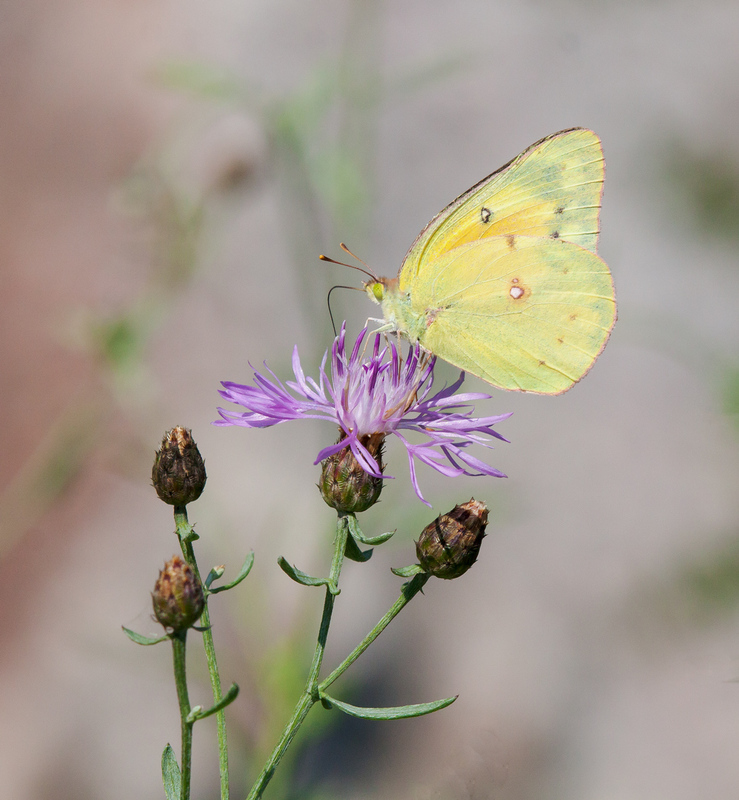 I love photographing the nondescript butterflies that are so common that they fly by virtually unnoticed, like this beautiful little sulphur butterfly that I spotted last week at Occoquan Bay National Wildlife Refuge. I believe it is an Orange Sulphur butterfly (Colias eurytheme), though it is often hard to distinguish that species from the Clouded Sulphur (Colias philodice), so I am a little uncertain of the identification. What I am certain of, however, is the delicate beauty of this butterfly and I am happy that I was able to capture some of that beauty in this image. As I gaze at this photo, I am reminded of the moment when I took it, a moment when I was enveloped by a sense of deep tranquility as the gorgeous sunlight illuminated the wings of the butterfly. Quite often when I am pursuing a subject, I can feel my heart racing a little as adrenaline kicks in. This was one of the rare circumstances when I had the opposite physical reaction. It is hard to describe in words what I was feeling, though it was definitely cool to experience. I hope that some of you will get a sense of that tranquility from this image. Iam becoming more and more convinced of the value of taking life a little more slowly, of opening myself up to experiencing the beauty that surrounds us every day. Do you consider yourself to be artistic? All of my life I have been in awe of people who can draw and paint and create art, but have never considered myself to be artistic. Increasingly, though, my photography has opened up a creative side that I am trying to nurture. As some of you know, I decided that I want to try my hand at watercolor painting and did a posting not long ago on my first efforts at doing a landscape. 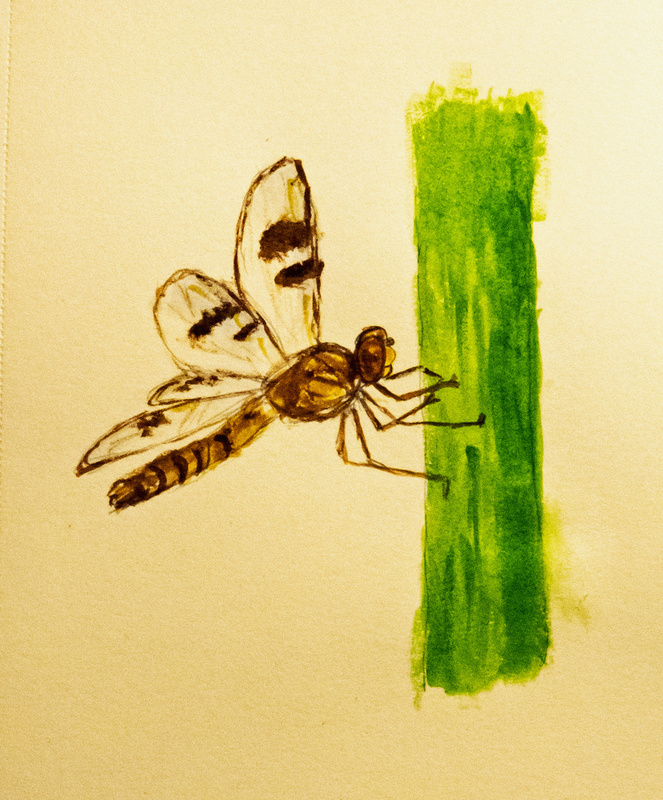 I don’t usually shoot landscapes with my camera, so I thought that I would try a more familiar subject for my second project—I decided to try to paint a dragonfly. In retrospect, I probably should have chosen an easier subject, but I am so inexperienced in art that I didn’t realize what I was getting myself into. For inspiration, I used a recent photo that I took of a female Eastern Amberwing (Perithemis tenera). I have already included it in a blog posting, but am reprising it as the final photo, so you’ll know what my artistic efforts were supposed to look like. I tried a couple of different approaches to my subject. 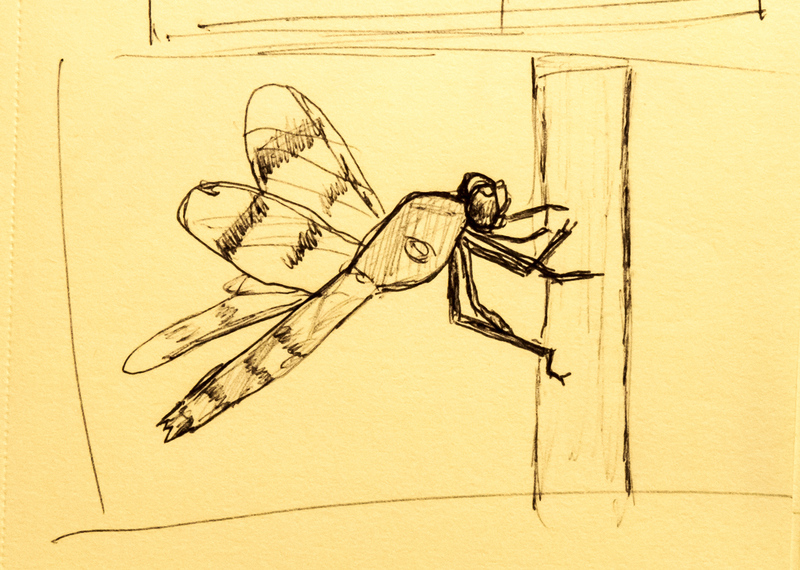 First I tried sketching the dragonfly. I didn’t have a pencil handy, so I used a Bic ballpoint pen. My observation skills and sense of proportion are definitely lacking, but it was surprisingly fun to try. Without an eraser to correct my errors, I felt a bit like I was walking on a tightrope without a net. Then I tried to draw with Crayola crayons? Why? I happened to be at Walmart yesterday and picked up a pack of 24 for only 50 cents at a back-to-school sale. My drawing looks a bit like a cartoon to me. Finally I was ready to try watercolor. I decided that I would do the painting without bothering to sketch it out. Oops. 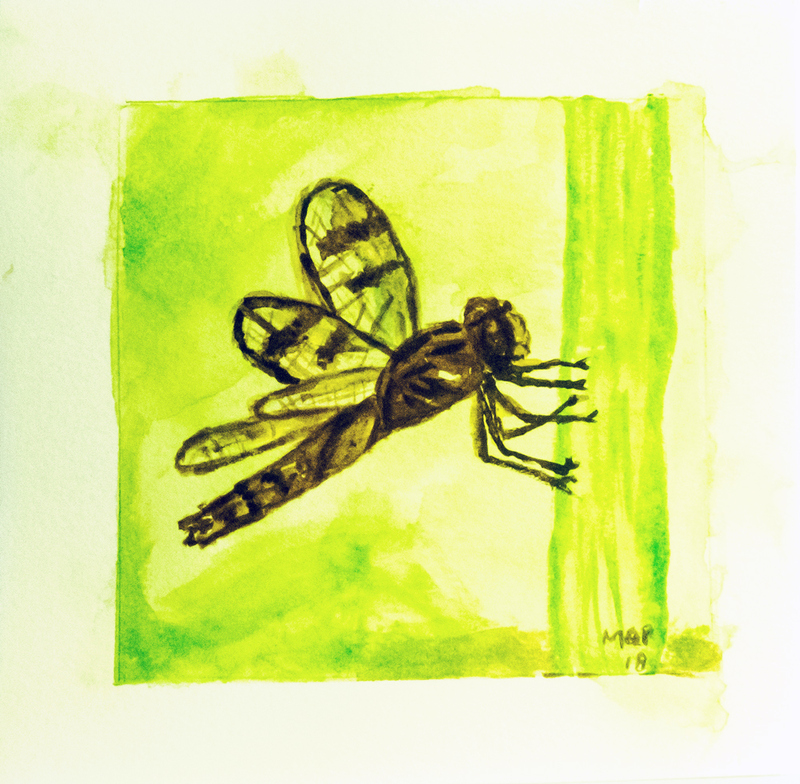 I was using some inexpensive paper and it started to buckle a bit when I tried to cover the entire area with an overly wet wash of light green. I think I then attempted to put on the next layer before the first one was fully dry. I still feel like a second-grader in my watercolor skills, but it still was enjoyable trying to see what worked and what didn’t. I did my final attempt in a sketchbook that is not intended for watercolor. 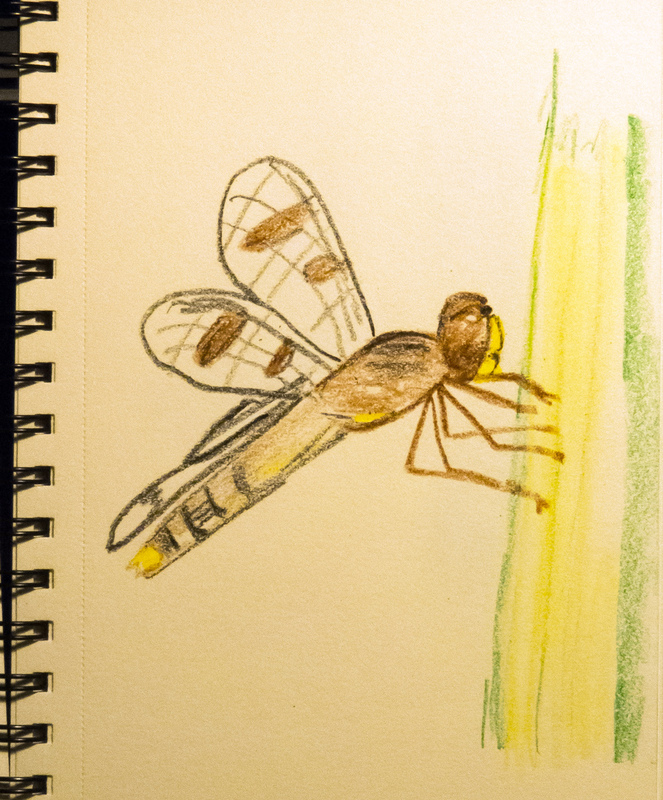 I sketched out the dragonfly with a mechanical pencil and then colored the sketch with my watercolor paints. Out of all of my attempts, this is the one that I like the most. I felt a bit more confident in using the paints and in some of my strokes. So what did I learn? Most significantly I learned that it’s worth taking a risk of feeling embarrassed; that it’s ok to try something new and achieve only a limited amount of success;, and that the amount of enjoyment that I can derive from a creative pursuit is not directly tied to any specific outcome. 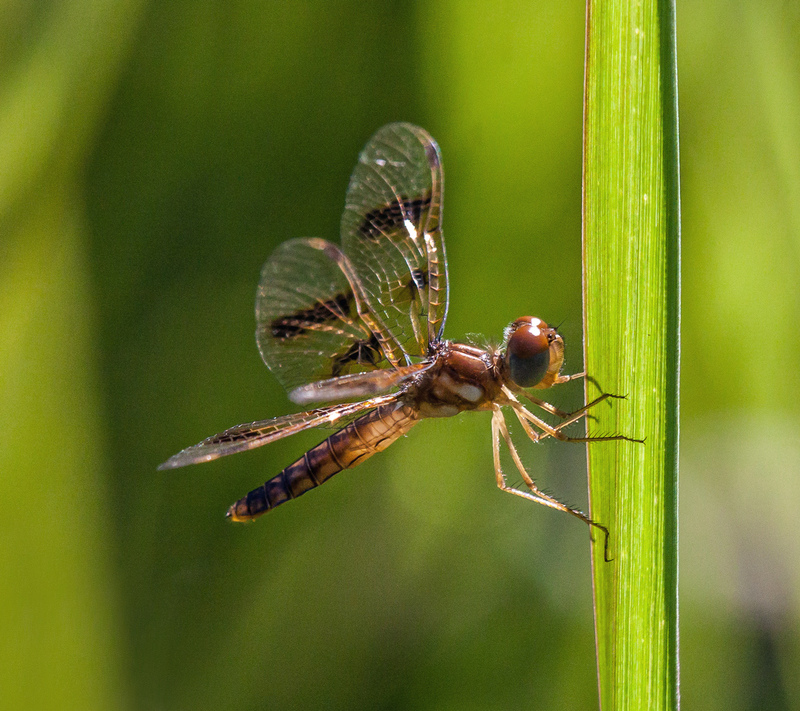 Eastern Amberwings (Perithemis tenera) are the smallest dragonflies in our area. You can often find males buzzing around at the water’s edge, but females are harder to spot because they hang out in vegetation away from the water. I was thrilled therefore to see a beautiful female this past Friday at Occoquan Bay National Wildlife Refuge in some beautiful morning sunlight. 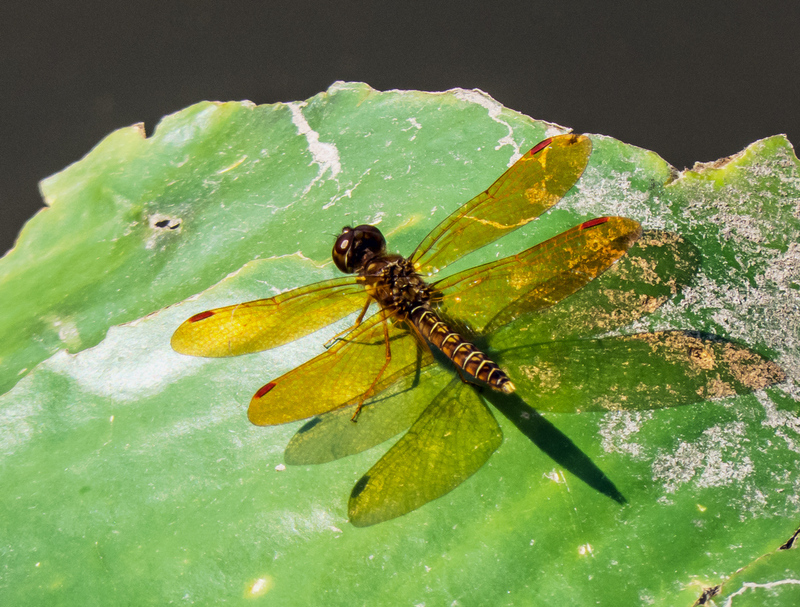 I decided to give a male Eastern Amberwing dragonfly equal billing in this post, because I really like the way that the shadows and the reflections make it look like he has an elongated body and extra sets of wings. 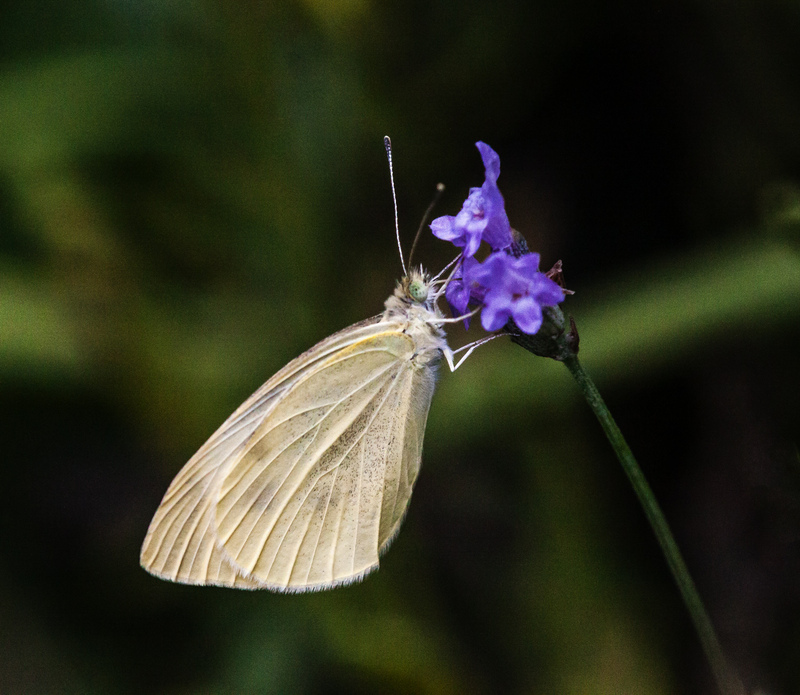 In a moment of calm amidst the storms this past Monday, I captured this shot of a beautiful little Cabbage White butterfly (Pieris rapae) in the garden of my neighbor and fellow photographer Cindy Dyer. The shot is a little grainy, because there was not a great deal of light, but somehow the image fills me with an overwhelming sense of serenity. 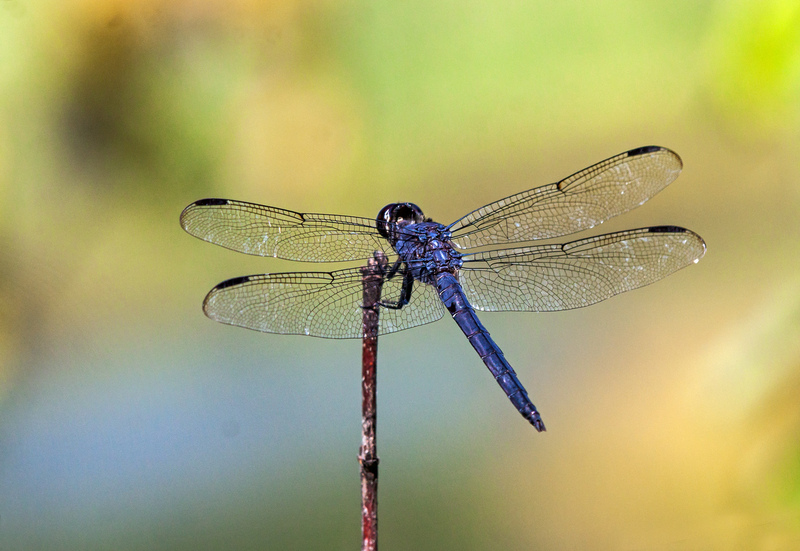 I love the dark, slate-blue tones of the male Slaty Skimmer (Libellula incesta), one of the most common dragonflies in our area. The beauty of this handsome Slaty Skimmer was further enhanced by the colorful backdrop that I managed to capture this past Friday at Occoquan Bay National Wildlife Refuge. It is hard to come up with a composition that is more basic—beauty can often be found in simplicity. Many of my photographer friends have been posting photos of hummingbirds and I felt a little left out. 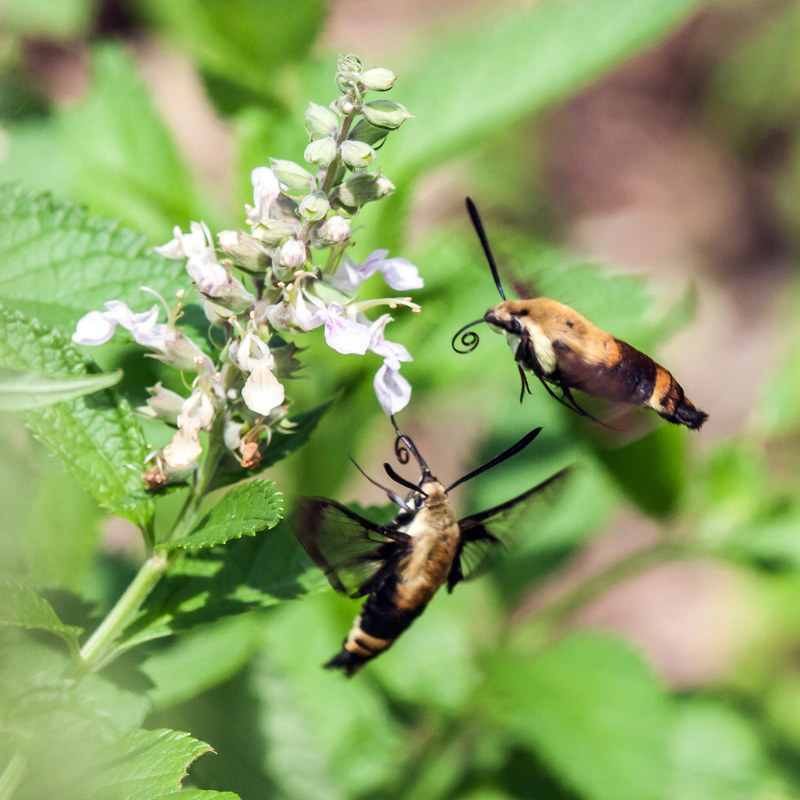 I didn’t see any yesterday, but did spot several Snowberry Clearwing moths (Hemaris diffinis) at Occoquan Bay National Wildlife Refuge. 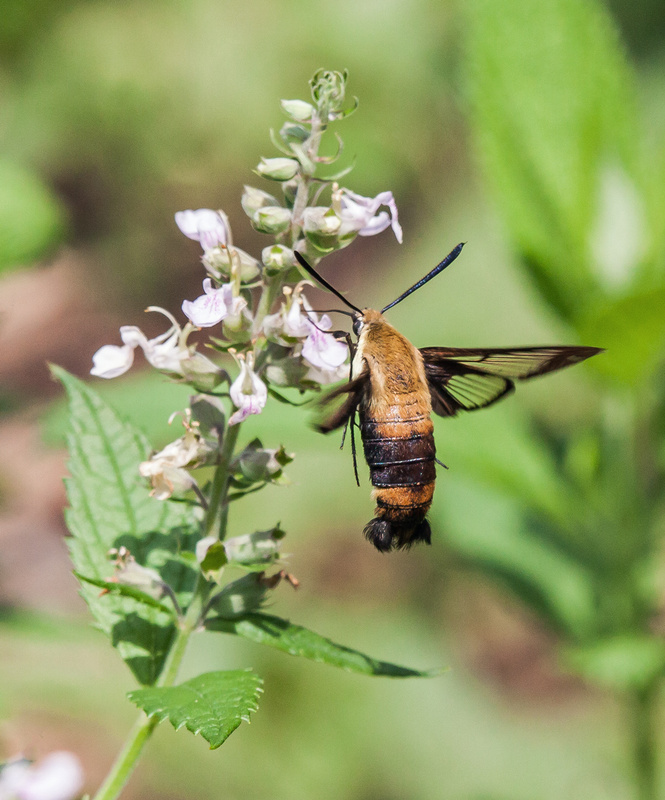 This species, along with other clearwing moths, is sometimes called a “hummingbird moth” because of its appearance and behavior, which reminds some folks of a hummingbird. 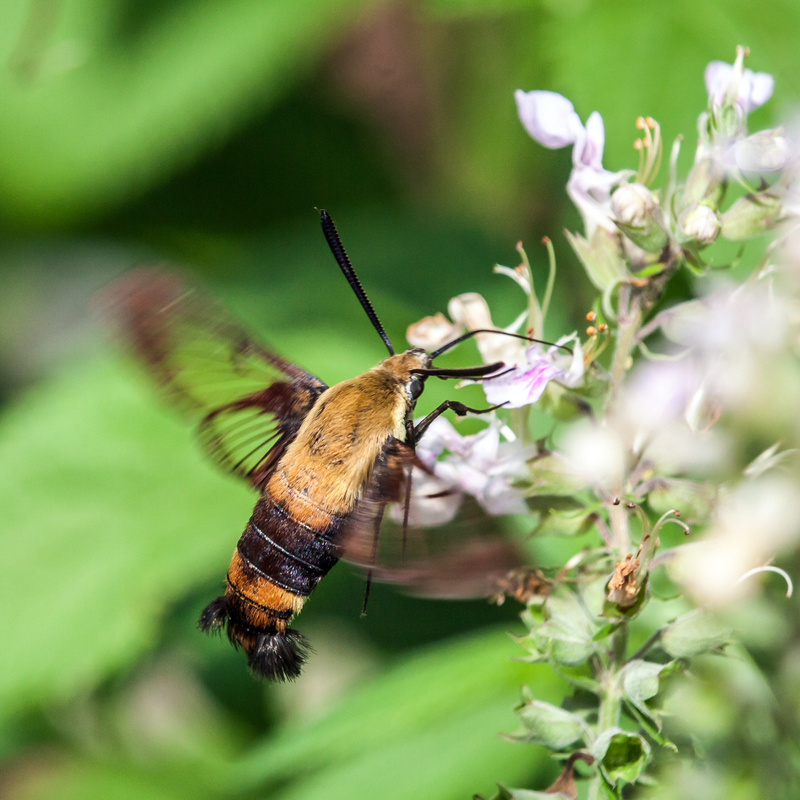 Most of the times in the past that I have seen a hummingbird clearwing moth, it has been a “cousin” of this species, the very similar Hemaris thysbe. That species, however, has more red on its body and has lighter colored legs, according to the butterfliesandmoths.org website. As you might suspect, these moths are in almost constant motion. Its is quite a challenge, therefore, to track them and keep them in focus as they dart among the flowering plants. As I was tracking one, a second one flew in and seemed intent on dislodging the first one. I reflexively I pressed the shutter button and was a little shocked to see that I managed to capture them both in a single frame. It’s cool that they both had their long proboscises curled up at the moment I took the shot. 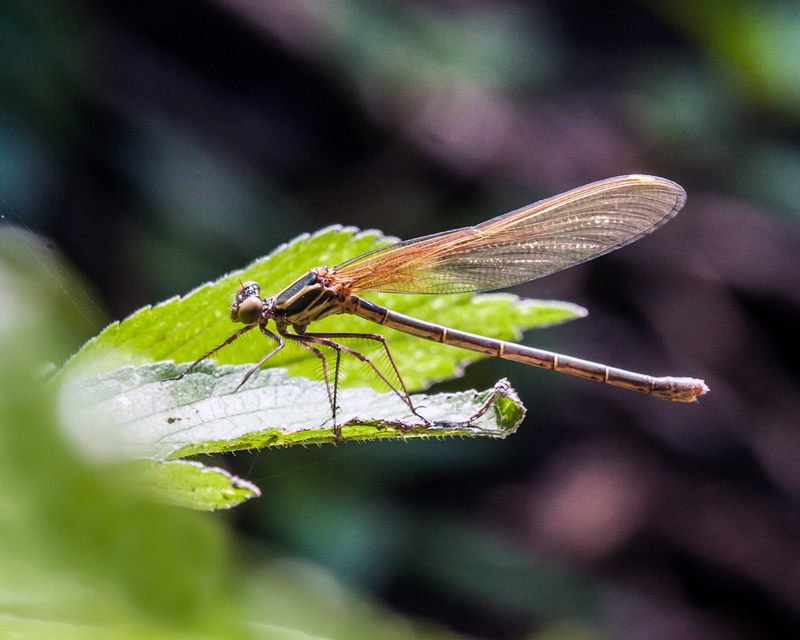 Yesterday as I was exploring Riverbend Park in Great Falls, Virginia, I encountered several damselflies that were new to me. When you spend as much time as I do searching for insects to photograph, you develop a sense of what is “normal” and I am able to decide almost immediately whether a subject is a familiar one or not. Those of you who know my work are aware that familiarity with a subject is not a criterion for photographing it—I am just as likely to take a shot of a common subject as a rare one. As I looked though my reference books and material on line, I was able to determine that I had captured images of both the male and the female American Rubyspot damselfly (Hetaerina americana). One of the experts in a Facebook dragonfly forum pointed out the dragonfly in the first photo below is an immature male, which helps to explain why the red spot for which the species is named is not yet prominent. 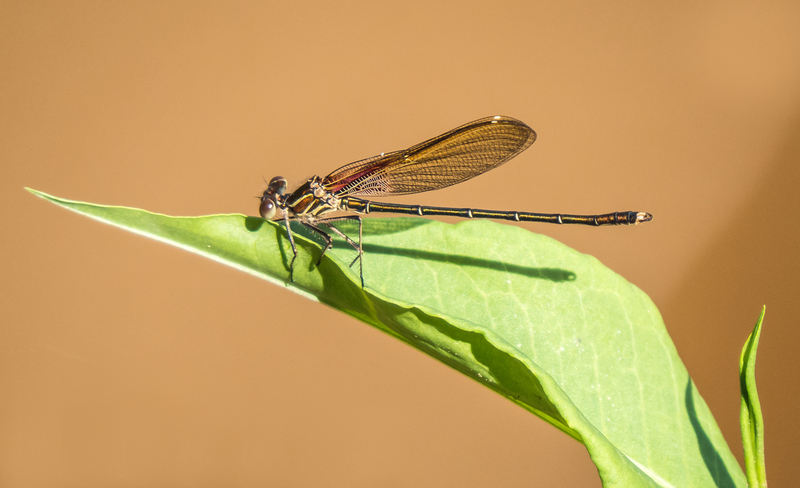 I won’t go into the details of damselfly anatomy, but if you compare the dragonflies in the two photos, you can see some of the gender differences that often help in identification. The very tip of the abdomen, the part of the body that many folks refer to as the “tail,” is quite different for the male and the female. There is also some color differentiation. Alas, these are general rules that don’t apply in all cases, so I am often confounded when trying to identify the species of a given subject. It is really cool that I continue to encounter new species. Part of the reason for that, I suspect, is that I am exploring some new locations. More importantly, though, my observational skills have improved dramatically over time and I am seeing things that I might not have noticed several years ago.